'The Black Pearl Cottage, winner of 'The California Coastal Home of Year' award! Lodging in a beach front vacation cottage, surf view villa or one of four very private luxury suites contained within their confines. The place for perfect honeymoon accommodations, quiet weekend retreats, small family gatherings, corporate meetings, and romantic getaways any time of the year. Summer regatta watch extrodinaire! An awesome winter storm watch from your private snug quarters by a cozy fire, a deep Japanese hot tub, or from one of the most luxurious beds it is possible to watch the drama of the ocean unfold from sun up to sunset. 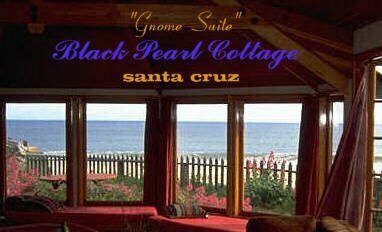 From the article 'BEST BEACHES IN CALIFORNIA': "Best lodging for beach lovers, the 'Black Pearl Cottage', a dreamy gabled cottage overlooking 'Seabright Castle Beach', in Santa Cruz", quote SAN FRANCISCO FOCUS MAGAZINE. "Panoramic ocean views in elegant, yet casual, emotionally freeing environments." editorial quote, SAN JOSE MERCURY NEWS. Located in a charming beach community noted for its historic beach homes. This is the "quiet" side of the Santa Cruz Yacht Harbor. Where you can walk to the finest Harbor and Wharf restaurants, outdoor cafes' and entertainment; and to the Santa Cruz Boardwalk without ever crossing a busy street, using little known pedestrian pathways used only by locals. Scenic nature trails and pathways abound! Go to the web site to see all the many things to do and see within walking distance of the Cottage & Villa, and to find the areas best restaurants! See you at http://www.blackpearlcottage.com where you can see great photos and check available dates and rates.